Pork and beans is something that I have eaten, and loved, throughout my whole childhood (and well into adulthood). Yes, I do mean good old pork and beans in the can. It may not be the healthiest, but it was something my brother and I always looked forward to when we were little, and as such, something that can never be truly “bad” for me, because it holds such a strong sense of nostalgia. I remember what my parents would do, to make it taste more “home-cooked”, was to sauté some onions and garlic, and perhaps a bit of bacon, before adding the pork and beans. And then the “secret” ingredient, a small dollop of mustard to take away the canned taste. We loved it! And to this day, the few times we have pork and beans, I prepare it this way. In the interest of cutting back on the canned and processed food however, I try to make different versions around the same theme of pork and beans. And since I adore both pork, and legumes of any kind, I love thinking of new ways to serve them. One such recipe appeared in my column in Yummy magazine – using pork belly and green beans, cooked in a very Filipino style marinade of soy sauce and calamansi. Some of my favorite dishes involve both pork and beans – fabada, lentejas, even monggo. Here is another version I threw together when I was pressed for time and needed to put a meal on the table in no time flat. The pork coming from smoky Spanish chorizo and the beans from creamy and earthy chickpeas. This can seriously be made with hardly a ruffle to your feathers. And it’s delicious! – Heat a skillet or wok over medium high heat. Add a couple of good glugs of olive oil and, when the oil is hot, add the onion and garlic. Sauté this until the onion is golden and caramelized. 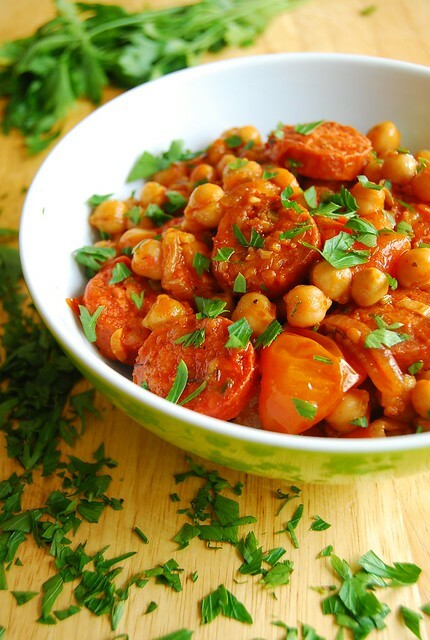 – Add the cherry tomatoes and toss to coat in oniony juices. Let this fry and sizzle for a couple of minutes, tossing once or twice, until tomatoes are starting to slump but not totally mushy. – Push the tomatoes to one side of the pan and add the chorizo. Fry the slices for a couple of minutes on each side, add the pimenton and oregano, then toss with the tomatoes. Add the chickpeas and mix. Season to taste with salt and pepper and cook for a couple of minutes more until the flavors have melded together. – Top with chopped parsley if using. I realize that I’ve said that I am trying to cut back on canned food but I do use canned chickpeas here. I try as much as I can, to avoid them, but I won’t drive myself insane doing it. Canned products I usually have on hand are the aforementioned chickpeas, and canned tomatoes (and coconut milk). Sometimes a can of Spam or corned beef or vienna sausage find their way into the pantry…care of the husband 😉 No disaster…I have good intentions but I try not to be a drill sergeant about it. Anyway, enough caveats. This is incredibly easy to make, quick, and tasty. If you haven’t got any fresh parsley on hand, no worries, leave it out. Add some quickly blanched spinach (or simply dressed salad greens) on the side, and maybe a thick slice of artisan-y bread (something from the sourdough persuasion would be nice) and you have a complete meal. That being said, I am Filipina so I love this piled on some just-cooked rice! You can drizzle on some extra virgin olive oil and just a touch of balsamic vinegar (or better yet balsamic glaze) for some added pizazz. You can also add a few shakes of cumin while cooking, then pile everything in a pita with some pickled chili pepper. If you have leftovers, or a hangover, it’s great topped with a fried egg for breakfast. On other topics…I am off to Hong Kong tomorrow! A long planned weekend away for both C and I, booked in the spur of the moment months ago when an airline’s promotional fare was too good to resist. I’m looking forward to some much needed relaxation, sleeping in, delicious food (recommendations welcome! ), and, of course, just being with my guy 🙂 When I get back I have another giveaway planned for you all! Until then, wishing you all a wonderful weekend! I love chorizo in anything. Will cook this dish asap. Thanks for sharing and have a lovely time on your trip, J! Yum, this looks sooo delicious! Hi Yung! I don't subscribe to being too strict with food, so yes, occasionally I think it should be fine!